The King's Speech, a film based on the life of King George VI (Colin Firth) and his efforts to overcome a stammer that made his frequent public speaking engagements nothing short of torture, is a film that perfectly illustrates how great chemistry can allow a film to transcend the trappings of its genre. In this instance, a film that could be a stuffy and staid period piece emerges as a fun, lively film about an unconventional friendship that just so happens to be set against the backdrop of earth-shattering events. The film opens in 1925 as the Duke of York - Bertie to his family - is preparing to deliver an address at the Empire Exhibition, an event which is being transmitted to millions across the globe via radio. As he falteringly makes his way through his pre-prepared speech, director Tom Hooper (The Damned United, HBO's John Adams) uses uncomfortably close shots of Firth's face and those of his subjects to illustrate how awkward and painful it is for all involved. Decorum and tradition means that he has to speak and they have to listen, with neither side able to help the other by cutting proceedings short. The speech proves understandably traumatic, so Bertie and his wife Elizabeth (Helena Bonham Carter) set about trying to find a therapist who can help him avoid such scenes in the future. After the initial experts fail to help, Elizabeth seeks out Lionel Logue (Geoffrey Rush) an Australian speech therapist renowned equally for his unorthodox and controversial methods and for his high success rate. After a funny scene in which Elizabeth tries to play the commoner and asks for Logue's help as the wife of an ordinary man before revealing her regal status, Logue and Bertie begin a tentative round of therapy. All of this is really prologue to the main body of the film; the relationship between Bertie and Logue. By the very nature of the story, the two characters need to have chemistry if the film is to succeed. Fortunately, they have it in spades. Initially reticent, due to the gulf in social status that exists between them and their very different attitudes towards life - Logue is very open whilst Bertie, owing to his royal upbringing, is reserved and doesn't want to talk about the possible underlying psychological causes of his stammer - the two quickly develop an off-kilter friendship, complete with in-jokes and a deeply ingrained trust that allows them to work together to help Bertie speak. It's to the film's credit that it doesn't present Logue's treatment as a magical cure-all, instead depicting it as something akin to real therapy - a long, arduous process that can take years to yield even the most basic results - and it is to the credit of the script and the actors that their scenes together are nothing short of delightful. Both Firth and Rush are fantastic, playing their roles with just the right balance of seriousness and playful humour to make their therapy sessions feel both important and frivolous. Rush, portraying the character with the least to lose and most to gain, brings a warm, effervescent charm and a killer deadpan delivery to the role, whilst Firth brings a reserve and vulnerability perfect for a man who taught to observe a strict set of rules but who realises he is fast running out of options. The dynamic between the two subtly shifts as they become friends and equals but that central contrast injects a fun unpredictability to the film that is quite intoxicating. Yet as that central relationship is the film's greatest asset, it is also its greatest weakness. The film is such a strong two-hander that as soon as they are separated a lot of its verve disappears. It never becomes boring, since Firth, Rush and Carter are all entertaining in their own right - as is the supporting cast, which includes Guy Pearce, Michael Gambon and Timothy Spall - but the spark that makes their scenes so electric is missing. The script also seems unable to find anything for the two men to do on their own. Logue's scenes with his family seem to be there purely to give him an opportunity to talk about his doubts and misgivings in a way which he never could with Bertie. Meanwhile, when the film tries to move from the personal to the political realm to depict the abdication crisis that forced Bertie to take the throne, it feels terribly rote and conventional in a way that, at its best, the rest of the film doesn't. Admittedly, that may be because as someone who, at the age of 12, memorised the line of succession of the British Monarchy from Harold I onwards, the story is overly familiar to me. People who weren't precocious pre-teen history nerds might find that aspect of the film more interesting than I did. Fortunately, Hooper does not keep his leading men apart for too long. Once the film moves past the abdication and focuses on the gathering shadow of war, contrasting Bertie's frustrated speech with the fiery eloquence of Hitler and Mussolini, it regains a lot of its energy and passion. 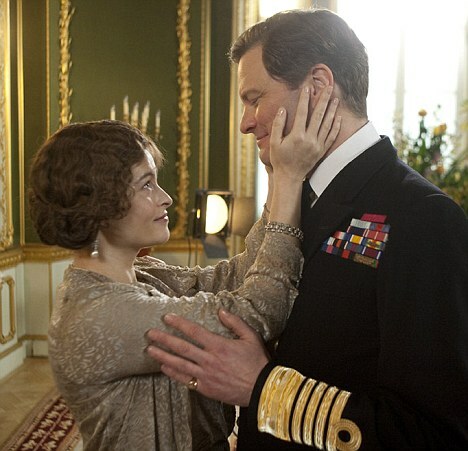 The setpiece of the film, in which Firth has to make his first wartime announcement, is given added weight thanks to the renewed efforts of the two to achieve their goal, yet the film still finds time to inject a bit of wry humour even as it prepares to uplift its audience. It's a strong ending to an unbalanced film, but one that at its best is as purely entertaining as any number of summer blockbusters, despite being about stammered syllables and pregnant pauses, rather than explosions.